yesterday the swiss cycle messenger championships 2006 were held in zürich, in the middle of the city. it was really a blast! 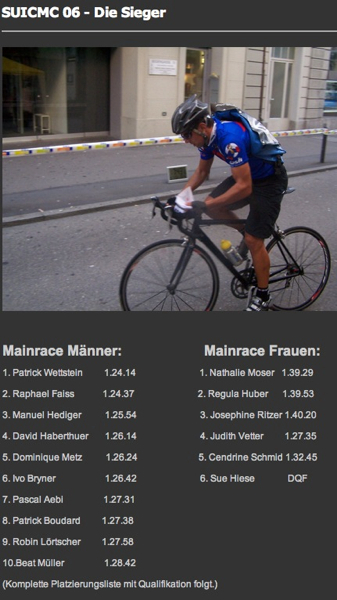 mostly because there were loads of spectators, the weather was super-nice, it was fun to meet other messengers in switzerland (i guess around 120 of ’em were there), but also, because i’m now officially the fourth-best messenger in switzerland, just a bit short after triple faiss and a wee bit faster than dom (both from lausanne). they seem to work perfectly, also all the old comments are imported….